Since the advent of invoice automation software nearly two decades ago, businesses around the world have adopted technology to streamline their invoice processes. This should come as no surprise. Due to the naturally high volume of paper, Accounts Payable is often recognized as one of the most error-prone and inefficient areas for most businesses. Even so, many companies today are still processing invoices either manually or with inadequate solutions from yesteryear. These companies stand to substantially benefit—like many of their peers before them—from a new generation automation solution. View the recording to find out how to apply to your organization. 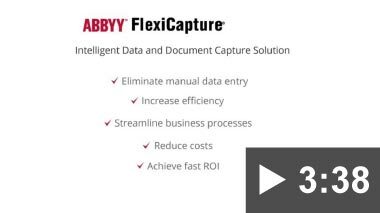 ABBYY® FlexiCapture is powerful data capture software that works with precision accuracy to convert paper and image documents into business-ready data. ABBYY FlexiCapture for Invoices is a turnkey capture solution that replaces costly manual data entry with efficient automated invoice processing. "Today invoice automation is not just for enterprise anymore. Smaller and midsize organizations, which have traditionally hesitated to invest in automation, are no longer hesitating, but rather beginning their journey. Our FlexiCapture for Invoices customers report more often an ROI within 6 months. In an automated environment the number of days to process decreases from 18 days to 5-6 days per invoice."